"Freaky pleasure...it scratches a nostalgic itch for those who grew up on Saturday morning Scooby-Doo cartoons and sugar-bombed breakfast cereal"
"Deliriously wild, funny and imaginative. Cantero is an original voice." A nostalgic and subversive trip rife with sly nods to H. P. Lovecraft and pop culture, Edgar Cantero’s Meddling Kids is a strikingly original and dazzling reminder of the fun and adventure we can discover at the heart of our favorite stories, no matter how old we get. horror fiends. Even more impressively, it scratches a nostalgic itch for those who grew up on Saturday morning Scooby-Doo cartoons and sugar-bombed breakfast cereal . . . The story proves as cleverly witty as its title. It's filled with high jinks both terrorizing and hilarious, and it goes down as smoothly as an old-school Scooby Snack." "Why You'll Like It: While this is obviously an ode to Scooby Doo, Supernatural fans will love the idea of a group of mystery hunters coming back together after leaving the business, and grappling with the realities of both." "A pop-culture gem, a hipster cartoon with surprising depths." "If you loved Scooby-Doo as a kid (or as an adult — no judgment), you’ll love this sly take on the genre." 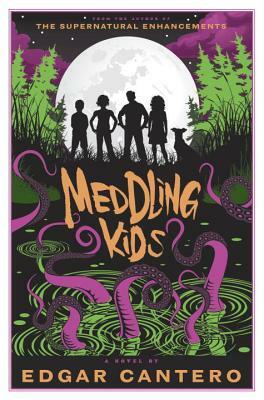 "MEDDLING KIDS is a fun romp of horror, humor, adventure, and a surprising amount of heart. If you’re looking for something that feels both comfortably familiar and exciting and new, add this book to your summer reading list." "A crackerjack story which is pure gold for fans of the great Saturday morning cartoons of the seventies and eighties...Prepare to read through this fun novel with a grin and hands gripping the pages." "Zoinks! For Scooby-Doo fans, Spanish writer Edgar Cantero’s novel “Meddling Kids” is Scooby-meets-H.P. Lovecraft — either humor-laced horror or horror-laced humor. Cantero does justice to both sides of that equation...For anyone who finds the triangle formed by Scooby-Doo, Lovecraft and Buffy the Vampire Slayer a cozy place to be, here’s your beach book." "For any adult who grew up with "Scooby Doo," but also for those who love horror stories. There are real monsters in this book, not just bad guys in costumes." "Here is the mash-up fans of Scooby Doo and H.P. Lovecraft have been waiting for...Childhood pop culture references, witty banter and an unpredictable plot make this a compelling mystery/horror story." "Cantero’s imagination is vivid, and the story, once it gains speed, continues at a breakneck, roller-coaster pace. He plays with form and style, which makes for an enjoyable romp. Fans of modern takes on Lovecraft and those that are nostalgic for the cartoons of their childhood will like this novel, which is also a sure bet for your Stranger Things-themed display." "Cantero (The Supernatural Enhancements) will win readers’ hearts with this goofy, smart love letter to childhood adventure and enduring friendship...The prose is fast and funny, and the quirky, lovable characters are absolutely irresistible." "The Scooby-Doo Gang all grown up—but more diverse—and taking on real Lovecraftian horror. It's laugh out loud. Truly scary. And full of great characters. Cantero hits the sweet spot by unfolding the action in a beautifully cinematic fashion."